I’m driving at dusk with one hand on the wheel. The baby is screaming. My right hand, stretched backwards, rocks the car seat while I chant aah and ohm, matching the volume of the screams, for as long as my breath will allow, trying to fill the car with white noise. My four-year-old looks out the window, tuning it all out. At any moment, a deer or chipmunk might bolt in front of my car, or I might turn a corner to find a semi veering into my lane, head-on. Last week, flash floods washed red earth over every road in the area, so it’s impossible to make out the yellow line, to tell where one side ends and the other begins. Every so often, the baby stops crying for about 60 seconds, and I wonder if he’s gone to sleep, or if he’s died, but then he pipes up again full-force. The Whys scared me because I discovered that my answer kept changing: Because I want us to grow as a family. 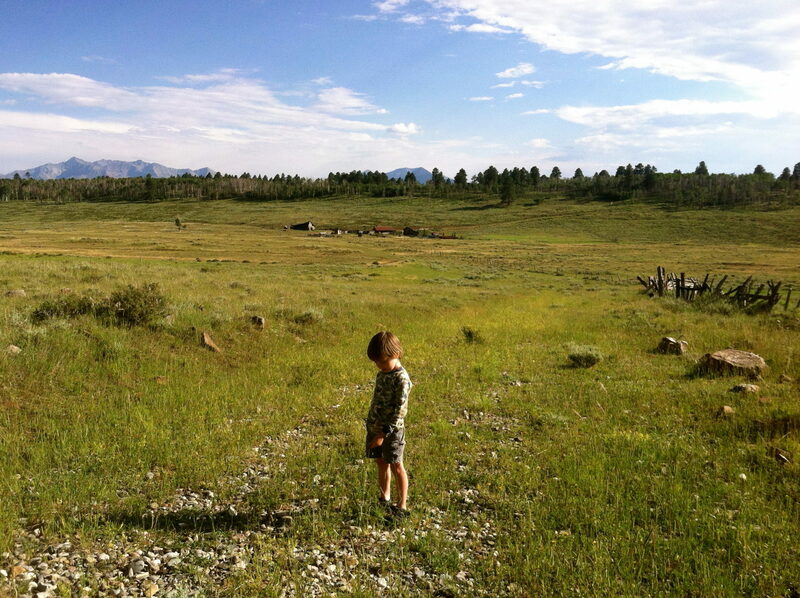 I want my four-year-old to have more nature and less screen time. Because I want time to be elastic, like it was when I was in my twenties, when I traveled alone for months, and my brain quieted enough that I could spend an hour looking at trees, at the way leaves caught the wind. Because I want to make space in my life, to break through the hermetic seal of our daily routine—dropping the kids off at daycare, going to work, picking them up, dinner, bedtime, doing it all over, and then cramming weekends with playdates and chores. I want to let in some air and see what happens. The people who asked why continued to look quizzical. The truth was that I wasn’t sure why we were moving. We had just spent months planning to expand and remodel our Olympia home. Kellie and I had each privately harbored qualms about the project, but neither of us spoke of them until the day we read an email from a friend describing a thousand-acre ranch in need of caretakers. Suddenly, we weren’t sure if we wanted to settle further into our comfortable middle-class existence, or drop everything and move the family to the mountains. We chose the latter—temporarily, at least. During the weeks we spent sorting stuff and packing boxes, I kept waiting for one of us to call the whole thing off. The night we arrived, I couldn’t sleep. The moon shone through an unfamiliar window, illuminating our boxes of stuff and the piles of junk that the previous tenants had left behind. Our dogs got up periodically to sniff around for mice. I lay in bed as my sons and Kellie slept, with a sickness that slid between my stomach and colon. I didn’t want to walk the 20 yards to the outhouse in the moonlight, so I lay awake, worrying that I’d been struck by food poisoning, or that perhaps a blood clot had formed in my legs from our days of driving, and I would die that night of an aneurysm. In the morning, Kellie would wake to find my cold body next to the baby. In addition to arranging my burial in this strange place, she’d have to switch the baby from breast milk to formula. I didn’t even know where the hospital was, I realized, or what we would do if our sons had an accident—a broken arm or a concussion—incidents that suddenly seemed probable. Wasn’t my primary job as a parent to keep my children from danger? If that was true, why were we here, 30 miles from the nearest town? Aside from the moon and the stars outside, I could see no light, no beacon of civilization. And what if I went crazy out here? So far I’d managed to dodge postpartum depression, but that was at home, where I had friends and work to occupy my busy mind. Here, in the wilderness, with only my family for company, how would I cope with all the emotions intrinsic to motherhood: impatience, desperation, sheer boredom? Finally, I trekked to the outhouse, then walked back to the bed, emptied. I slept until morning and woke to bright orange clouds, a rising sun. We made coffee and ate breakfast on the porch while a herd of elk marched down the hill and bugled to each other. Harlan, my four-year-old, came out bleary-eyed in his pajamas and curled up in Kellie’s lap. The baby resumed his nursing. In the month since that first night, we have avoided my worst-case scenarios. I haven’t lost my mind, though I lose my patience daily. None of us has died or been maimed. But we haven’t escaped the world, the way I hoped we would. Yesterday we packed the truck for the three-mile drive to a neighboring house. The owner was gone for the summer, and we had arranged to care for her plants and her pets in exchange for the use of her modern amenities: internet, laundry, and the occasional hot shower. I had work to do online, and though I’d imagined I would break away from the family and do it privately, it turned out that everyone craved the diversion of the house up the road. Harlan streamed videos on Netflix while Kellie started a load of laundry, charged her phone, and carried the baby around in the front pack. The weather was perfect: 75 degrees, clear skies, end-of-summer light; but Harlan and I stayed glued to our computers, snacking and fending off the resident cats who hungered for our attention. By lunchtime, the rain had arrived and Kellie reappeared with the baby. Outside it poured and hailed; pellets of ice hammered the roof with an intensity that kept us inside at all costs. I had just kicked Harlan off the computer, but Kellie, bored, reopened Netflix and began streaming The Avengers. Harlan lay beside her on the couch. The storm made the Internet slow, so the movie became a three-hour affair—ten minutes of viewing, five minutes of waiting for the video to stream. Meanwhile, I worked while standing with the baby in the pack, my own progress hampered by the slow connection. By the time we got home it was 7:30 p.m., cold and foggy. Thunder and lightning passed through dark clouds in the distance. I waded through muck to fetch our rained-on dishes from the pump house sink while Kellie made a fire. We ate beans again for dinner, with kale leaves from the garden that Harlan pulled out and abandoned on the side of his plate. Up the hill, coyotes yammered. Later, Harlan ate candy in bed and fell asleep on top of his covers—the fire had made our family bedroom overly warm. I stayed up and wrote in the dark, the breath of sleeping bodies all around me. Time has its own elasticity here, different from the time I knew in my twenties. Here, I look back on the day, with its sun and its rain, and take note of everything I didn’t do: weed, take a long walk, or take the clothes off the line; bathe the kids, soak tomorrow’s beans, write a book. I take note, but then I let go, knowing that tomorrow will most likely bring sun and rain, and I will get a couple of things done, and I will neglect far more things, but I will go to bed fed and warm, and wake up to watch the sky change again. And though my son is as plugged-in as ever, dependent on my iPhone to get him through each day after unstructured day, the wilderness has reached him in ways I could not have predicted. He has become a climber of fences, a feeder of chickens, a saver of snake skins, a photographer of mushrooms, a tracker of the stars. Two days ago, a herd of free-range cattle descended on our driveway, and Harlan decided he wanted to “touch a cow.” Five minutes later, I turned around to find that all the cows had fled and a large black bull was standing his ground. “Turn around and run to me right now,” I hollered. Harlan ran a bit, and then skipped a bit, then walked the rest of the way to me, clearly wondering what the problem was. Less than 24 hours later he was chasing the alpacas down, a carrot in each hand. On another drive home, this one after an evening spent soaking at the hot springs, Harlan spotted the glow of a planet. As the sky continued to darken, and the milky arm of our galaxy came into view, we talked about stars and solar systems, the possibility of an infinite universe. Our little black car climbed the mountain and brought us home. This time the baby slept easily, tired from playing in the water and full of milk. When I left our home in Washington, I expected that clarity would descend after a week or a month; that slowly, gradually, I would know where I belonged. Either I would fall in love with this wilderness and never want to leave, or I would be miserable, cooped up with two kids, impatient to get back to my own life. Instead, the clarity I find is that both lives are viable, each filled with petty annoyances and small joys. 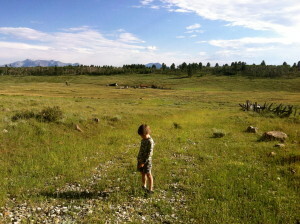 Would I trade the elk on the field and the morning sky for the luxury of good friends within walking distance? Would I trade the exhaustion of raising two young children without a break in sight for the daily grind of working from an office? I don’t know. All I know is this: right now I am here. Jennifer Berney‘s essays have appeared online in Brain, Child and Mutha Magazine. She lives in Olympia, Washington and blogs at Goodnight Already. Lovely piece and great conclusion. I recently moved back home after being abroad and find similar issues--thinking I should have a clear answer about where I belong but I don't--at least not yet.